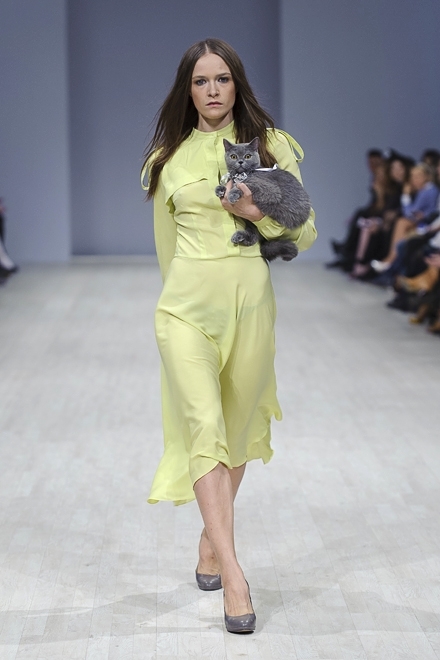 The 31st Ukrainian Fashion Week kicked off today! Do you know what this number means? It means that UFW has been around for 15 years, longer than any fashion week in Russia! The amount of great designers in Ukraine is astounding (45 of them are showing at UFW alone), and I’m really amazed by the fact that Ukrainians didn’t have Vogue until recently. Stay tuned for our daily reviews of the best Spring 2013 collections! Poustovit show traditionally opened the fashion week, featuring sheer and printed silk dresses in a refreshing palette of white, coral and blue. While it seems that Lilia Poustovit’s signature shirt dress has spread to each and every collection at UFW, nobody can incorporate folk prints into modern designs better than her. Victoria Gres has proved again that “fashions fade, style is eternal” by creating a breathtaking collection that doesn’t really correlate with any of the global fashion trends. All Gres collections look to me like she had found her inspiration in the past, and this particular one has strong 20s to 30s vibe: dropped waist, below-the-knee skirt length, shimmering atlas and lace. St Tropez? The Carribean? Bali? Wherever you go on vacation, this collection would make a great companion. I bet these tropical prints, light natural fabrics and feminine silhouettes with a slight hint of the 50s would make you itch for summer. While it may not be immediately apparent, the designer was inspired by Audrey Hepburn’s style in Breakfast at Tiffany’s… which has evidently been chopped and mixed in a blender. The result is youthful, provocative and elegant clothes for a confident woman. P.S. Check out the super professional cat putting her best face on for the camera.